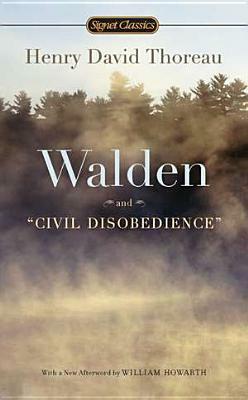 Henry David Thoreau reflects on life, politics, and society in these two inspiring masterworks: Walden and Civil Disobedience. In 1845, Thoreau moved to a cabin that he built with his own hands along the shores of Walden Pond in Massachusetts. Shedding the trivial ties that he felt bound much of humanity, Thoreau reaped from the land both physically and mentally, and pursued truth in the quiet of nature. In Walden, he explains how separating oneself from the world of men can truly awaken the sleeping self. Thoreau holds fast to the notion that you have not truly existed until you adopt such a lifestyle—and only then can you reenter society, as an enlightened being. These simple but profound musings—as well as “Civil Disobedience,” his protest against the government’s interference with civil liberty—have inspired many to embrace his philosophy of individualism and love of nature. More than a century and a half later, his message is more timely than ever. W.S. Merwin has published many highly regarded books of poems, for which he has received a number of distinguished awards—the Pulitzer Prize, Bollingen Award, Fellowship of the Academy of American Poets and the Governor's Award for Literature of the state of Hawaii among them. He has translated widely from many languages, and his versions of classics such as The Poem of the Cid and The Song of Roland are standards. William Howarth is Professor Emeritus of English at Princeton University. His thirteen books on literature and history include The Book of Concord: Thoreau's Life as a Writer, Walking with Thoreau, and The John McPhee Reader. As "Dana Hand" he collaborates with Anne Matthews on fiction and film, and as co-publishers of Scarlet Oak Press.